Humfrey, Duke of Gloucester (d. 1447) was the youngest brother of King Henry V (d.1422). He was a lover of books, and founded what subsequently became the Bodleian Library, Oxford. This manuscript was his own prayerbook, as shown by the inclusion of his heraldry, and by his ownership inscription on the final page. 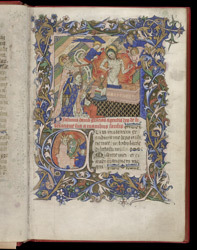 The text is similar to that of a psalter (having a calendar, psalms, litany, etc. ), but is unusual because it contains only a selection of the 150 psalms. The kneeling figure has been identified as a king (presumably Henry V or Henry VI), but he wears a ducal coronet, not a crown, and is therefore probably Duke Humfrey.